If you think I didn't press play on "My Heart Will Go On" as I started writing this, then you, my friend, are so very wrong. 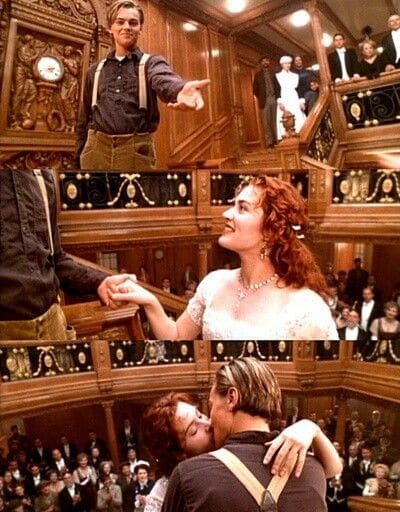 Titanic was a cinematic masterpiece and was a crazy part of many of our childhoods. However, as an adult, I have several thoughts about Jack and Rose's love story that I need to get off my chest. 1. So can we all agree that it's a little effed up how Jack and Rose knew each other for less than a week, yet fell madly in love? Ruth would not approve. I'd say it's around the one-month mark when I let someone draw me naked. But hey. That's just me. Also, I definitely should not have been allowed to see this movie at 9 years old. 2. What the hell happened to the little girl who Cal stole in order to get on a lifeboat? Did he just diss and dismiss her? Did she ever stop crying?! 3. Guys. You know people can see you, right? You're literally making out at the front of the ship. Maybe we try to be a little less obvious when trying to hide our love? I bet you a million dollars that Lovejoy was watching them from a corner. 4. How did we not lose our minds over Rose having an abusive fiancé at the age of 17? I get that her mom was using her own daughter to secure herself some money, but did we all just let the age thing slide? 5. We know Rose was 17, but how old was Jack?! I mean, it was 1912, and rules were probably a little different buuuuuuut come on. Titanic Wiki has informed me that Jack was 20 years old, and now I'd like to contact the authorities. 6. If I thought a three year difference was bad, then I really shouldn't have looked up how old Rose's fiancé was. Cal was 30, y'all. And I'm now suffering from a severe case of the nopes. Just when you thought you couldn't hate Cal anymore. 7. Cora's side-eye toward Rose is everything that matters in this entire movie. How dare you steal Cora's man, Rose. Don't worry. She's still Jack's best girl, and honestly that's the most important thing. 8. Can we talk about how dead Rose meets up with Jack in heaven instead of her husband? He's probably chilling in the afterlife waiting for his wife to arrive, and she never does. 9. Old Rose is actually a bit of a B. She heard Brock Lovett's sad tale about how he's spent forever searching for The Heart of the Ocean, and she goes and throws it overboard. Maybe we hand it to him like a civil person?! Honestly, Rose! As much as I hated Ruth — and oh my did I hate her — the woman had some seriously sage advice that I never understood until I was an adult female making it in the world. Okay, Tommy had like, 5 full minutes of screen time, but he stole our hearts in those brief moments. He did not deserve to be accidentally murdered by Mr. Murdoch. Maybe he might have survived in the ocean. You don't know! 12. Ruth and her friends were the original Mean Girls. First of all, Molly Brown is a gem, and how dare you try and ditch her, Ruth? Secondly, where can I get my hands on one of those hats? 13. Can we take a minute to acknowledge that Mr. Guggenheim straight-up brought his mistress aboard a fancy ship, and everyone knew about it? What level of savagery was going around in 1912?! "Oh that's just Ben, being unfaithful in public again." 14. No one. Absolutely no one is listening to y'all right now, so either pack it up or take this opportunity to play something controversial. You are about to go down with the ship — how can you even play? 15. Rose and Jack walk into the room holding hands, and no one says anything? I know we were more focused on Jack "stealing" the diamond, but nothing? This would have been the perfect moment for Ruth to literally clutch her pearls. Sure, it's been forever since this movie came out, but it never gets old. Unlike Rose. I will still dedicate an entire afternoon on the couch to watch this movie in full. Mostly because, thanks to technology, I don't have to get up and change the VHS tape anymore. COMMENT and let us know your thoughts on watching Titanic as the older, wiser grown-up you are.